During the time of the introduction of cartons and of jigsaw puzzles another change was taking place which was developing much more slowly. A writer by the name of David Whitelaw persuaded the company to produce and sell a word game - Lexicon. This was basically a pack of cards but with the faces changed from court cards and pips to letters of the alphabet. The summer of 1932 saw the introduction of this game, when a small edition was produced and sold to test the market. This was the first Waddingtons game and its introduction had an unsuccessful beginning. The first edition was sold through the stationery shops at 1s. 9d. each and sales were practically non-existent. It was decided to pack Lexicon more attractively and raise the price to 2s. 6d. per pack. This was an unprecedented approach in the stationery world and there was much opposition and criticism. However, when the real launching took place in the autumn, heralded by an intensive newspaper advertising campaign, sales, instead of being a hundred a month were thousands a day, and there was a wonderful success which has continued up to the present time. Above: 1st edition of Lexicon, 1932. The set comes in a maroon slip case with the text "Patent applied for" and no registration number. The rules leaflet has the date 18/7/1932 printed at the bottom. Above: early edition of Lexicon with date 18/7/1932 printed at the bottom of rules leaflet. The box says “Patent Applied For” but the backs give a Reg. No. so we guess it dates from around 1932-33. Images courtesy Pete Bond. It was Lexicon which created the opportunity for Waddingtons to get Monopoly, because it gave the company credibility. Lexicon is now owned and marketed by Winning Moves, who purchased the brand from Hasbro, along with Waddingtons No.1 Playing cards. (Hasbro bought Waddingtons Games Ltd in 1994). Above: the spine of the re-designed box carries the text “Lexicon”, “By Atozed”, “Waddingtons” and the box and back design have the text “Regd No.529991”. The words ‘Master’ and ‘Ltd’ are printed in a different typeface to the earlier edition. The monogram is more or less the same but has been re-drawn. Click image to see alternative box. Image courtesy Matt Probert. Soon Lexicon was published in a smart slip case and many different editions have followed, including foreign language versions. Above: The rule book carries a date of October 1933, and a section on "How to Arrange a Lexicon Drive". The documentation also refers to "the increasing popularity of Lexicon Drives". (Click image to zoom). Image courtesy Matt Probert. Above: later edition of Lexicon in red or orange slip case in the shape of a book. Above: supplied in a cheap cardboard tuckbox, possibly during wartime paper rationing restrictions. Image courtesy Matt Probert. Note: the above account of the introduction of Lexicon is taken from “A History of Waddingtons” by Victor Watson, Northern Heritage Publications, 2008. 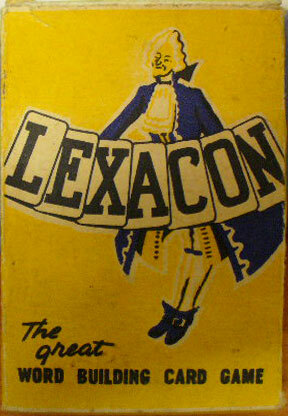 Left: imitation ‘Lexacon’ word building game from Australia.